On the outskirts of town stands a ramshackle house. It might not seem like much 'til you peek through the railings....then you'll find that there's a horse on the porch, a monkey in the kitchen and a freckle faced, red-pigtailed, whirlwind of a girl in mismatched stockings presiding over it all. This is the domain of Pippilotta Delicatessa Windowshade Mackrelmint Ephraim's Daughter Longstocking - or Pippi! Pippi Longstocking is a scrappy 9-year-old girl who asks a lot of questions and always puts bullies in their place but she has a tendency to get caught up in one outrageous adventure after another! 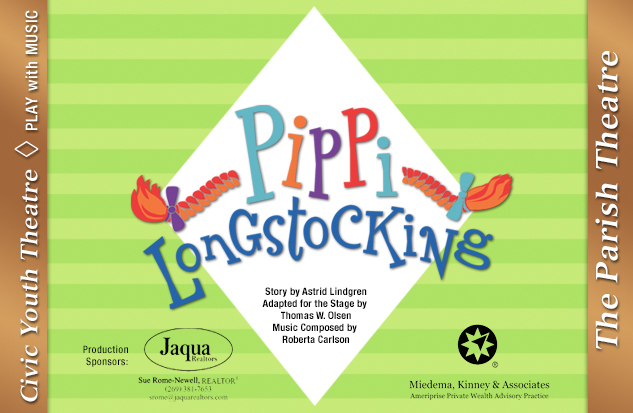 Whether she's fending off burglars, wrestling a circus strongman, or sailing away on a pirate ship, Pippi will win over the sternest of hearts in this rollicking musical adaptation of Astrid Lindgren's beloved book. "...focuses on joy and whimsy, with a whole lot of chances to dance, dance, dance."